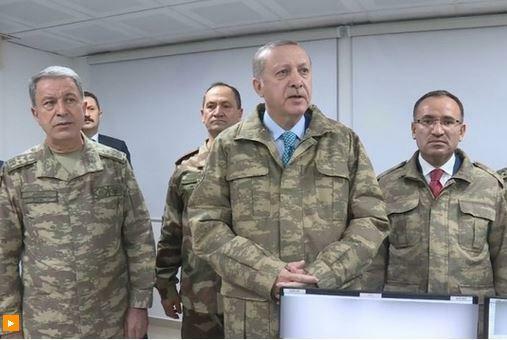 ANKARA, Turkey -- The day after a senior Trump administration official said the U.S. would prefer Turkish troops "remove themselves" from a conflict in northern Syria, Turkey's president has warned instead that he may expand the operations against Kurdish forces backed by Washington. President Recep Tayyip Erdogan said Friday that his forces could go even further in to Kurdish territory than his government had previously stated; all the way to the Syrian border with Iraq. That would mean pushing through the Kurdish strongholds of Kobani and Hasakah -- something that couldn't happen without Turkey reaching some agreement with the Kurdish forces, and their U.S. backers. For months Erdogan has said Turkey would rid the Syrian border towns of Afrin of Kurdish forces, which his government considers terrorists, and then push as far east as the Euphrates river. But his remarks on Friday indicate the Turkish leader's intentions to continue the "battles" beyond that boundary, all the way to the Syrian-Iraqi border. The Kurdish People's Defense Units, or YPG, forms the backbone of the Syrian Democratic Forces (SDF), a U.S. ally that drove the Islamic State of Iraq and Syria (ISIS) from much of northeastern Syria. At least 2,000 U.S. troops are embedded with the SDF and YPG in northern Syria, east of the Euphrates, where they are working to prevent a resurgence of ISIS. U.S. forces do not operate in or near Afrin. There are a small number of U.S. troops in the town of Manbij, between Afrin and the Euphrates, and Erdogan asked Mr. Trump earlier this week to pull them out. It is not clear whether Erdogan's government had signalled to Washington -- a NATO ally -- his intention to secure, or help secure, territory east of the Euphrates before the Turkish leader's speech on Friday to members of his ruling party. Speaking Thursday at the World Economic Forum in Davos before President Trump's arrival, his homeland security adviser Tom Bossert warned that Turkey, "ought to be mindful of the potential for escalation as they move into Syria and Afrin." Bossert said the Trump administration would prefer Ankara focus on "long-term strategic goals" like ending Syria's war. The United States has already expressed concerns over Turkey's military offensive against the Kurdish-controlled enclave of Afrin, which began Saturday, but Bossert's comments were the most direct call yet for Turkey to withdraw. The SDF said Friday that the first week of Turkey's incursion into Afrin had left more than a 100 civilians and fighters dead. The SDF said in a statement that the dead were 59 civilians and 43 fighters, including eight women fighters. It said 134 civilians were wounded in the weeklong clashes. Ankara views the YPG as a major threat because of its links to Kurdish insurgents in Turkey. The rising tensions between the U.S. and its NATO ally Turkey were on display after the phone call Wednesday between Mr. Trump and his Turkish counterpart, Erdogan. The White House said Mr. Trump expressed concern about the fighting and told Erdogan the Afrin operation jeopardizes shared goals in Syria. It said Mr. Trump also expressed concern about "destructive and false rhetoric coming from Turkey," in reference to recent anti-American statements made by Turkish officials. Turkish President Erdogan: "I am disillusioned" with the U.S.
Turkish officials disputed the White House readout, saying it did not "accurately reflect" the content of their discussions. They said Mr. Trump did not voice concerns about the violence or use the phrase "destructive and false rhetoric coming from Turkey." The officials spoke on condition of anonymity in line with government rules. Turkish Prime Minister Binali Yildirim lashed out at the United States, saying "it is astounding and unacceptable... that a country which is supposed to protect NATO's borders is giving open support to armed entities that target our borders." The Pentagon, meanwhile, said Thursday said Turkey's military operations in Afrin are not helpful and threaten to damage the ongoing fight against ISIS in Syria. "The degree to which focus is taken off the reason we're in Syria, which is to go after ISIS, is the degree to which it damages the overall effort," said Joint Staff Director Lt. Gen. Kenneth F. McKenzie Jr. "So it actually is not helpful to have these operations go on. We recognize that. And we're working with the Turks to try and minimize it." McKenzie said U.S. military commanders continue to talk with Turkey about the establishment of some type of safe zone along the border. Speaking during a Pentagon briefing, he said it's "simply an idea floating around right now" and there has been no decision yet. Turkish Foreign Minister Mevlut Cavusoglu told reporters that U.S. Secretary of State Rex Tillerson, during a meeting in Paris this week, had raised the possibility of the creation of a 20-mile "safe zone" in Syria running along Turkey's border. But he said trust between Ankara and Washington has to be restored before Turkey would be prepared to discuss the issue. When asked in Davos about the safe zone, Tillerson said "we discussed a number of possible options but we didn't propose anything." Bossert meanwhile said it would be a "terrible outcome" if Turkish troops clashed with "the proxy forces that we have all been relying on to defeat ISIS, especially if there are U.S. advisers in the region." He said there could be "grave consequences to any miscalculation and escalation." He acknowledged Turkey's "legitimate security concerns" about the Syrian Kurdish forces along its border, but said they were "smaller concerns than the grander strategic need for a stable and supportable Syria." "I'm not in any way critical of the Turkish decisions, but I'm just praying for their longer-term strategic patience," Bossert said. A new round of U.N.-led talks on Syria opened Thursday in Vienna, where U.N. special envoy Staffan de Mistura met with Syrian government representatives and planned to separately hold talks with an opposition delegation. De Mistura said the talks, which have made little if any progress since they began four years ago, are at a "very critical moment." Russia plans to hold separate peace talks on Jan 29. ISIS militants meanwhile launched a wave of attacks against government forces in eastern and northern Syria. The extremists have been driven from nearly all the territory they once held in Syria and neighboring Iraq but have proved they can still carry out insurgent-style attacks. The Syrian Observatory for Human Rights said ISIS militants attacked Syrian troops and allied forces stationed in the eastern Deir el-Zour province, killing over a dozen fighters in attacks several miles apart. State media also reported the attack, saying it had been repelled. ISIS announced a new offensive against Syrian government forces on its social media accounts. The Observatory said the militants are also on the offensive in northern Syria, where they seized a number of villages in Aleppo province that position them closer to a strategic road linking northern and central Syria. Over the past month, ISIS has established a presence in the northwestern Idlib province for the first time in four years, after it was expelled by rival Syrian insurgent groups.